From Left to Right: Dan Young, Senior Vice President of Insurance Relations, CARSTAR Auto Body Repair Experts; David James, Vice President of Marketing, CARSTAR Auto Body Repair Experts; Ernie Laky, Vice President of Purchasing, CARSTAR Auto Body Repair Experts; Frank LaViola, Assistant Vice President of Collision Industry Relations, Enterprise Rent-A-Car; David Byers, CEO of CARSTAR Auto Body Repair Experts. Photo courtesy of Enterprise. Enterprise Rent-A-Car has been selected as the preferred car rental partner for CARSTAR Auto Body Repair Experts, a U.S. multi-shop operator (MSO) network. 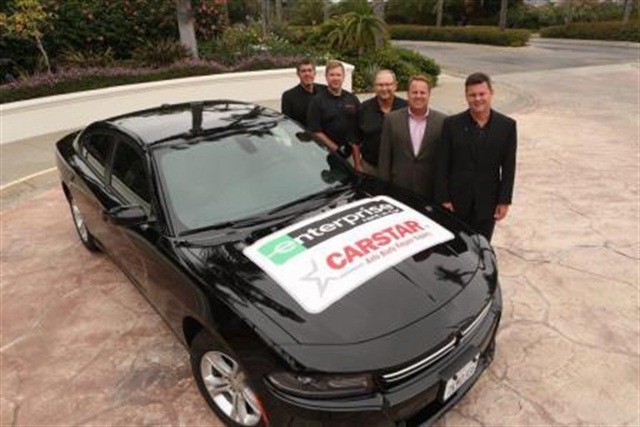 Through the partnership, CARSTAR is able to leverage Enterprise’s network of neighborhood car rental locations, its vehicles and its Automated Rental Management System (ARMS) applications for customers in need of transportation while their vehicles are being repaired. CARSTAR, which just celebrated its 25th anniversary, has more than 430 independently owned and operated stores across the U.S. and Canada. When an accident occurs, CARSTAR sends the tow truck, contacts the consumer’s insurance company, arranges a rental car and repairs the vehicle, according to the company.